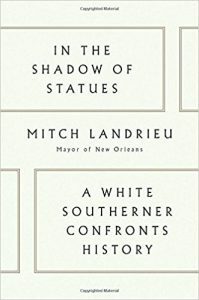 When Mayor Mitch Landrieu addressed the people of New Orleans in May 2017 about his decision to take down four Confederate monuments, he struck a nerve nationally, forcing into the open a reckoning with the institutional racism that shapes us today. Now Mayor Landrieu retraces his personal journey on race & the path he took to making the decision to remove the monuments. At a moment when racism is resurgent with seemingly tacit approval from the highest levels of government & when too many Americans have a misplaced nostalgia for a time & place that never existed, this book is necessary reading. Equal parts memoir, history,& prescription for finally confronting America’s most painful legacy, In the Shadow of Statutes contributes a strong voice to the national conversation about race today. It is a passionate, personal, urgent book for all Americans.